AUSTIN, TX. — New Orleans Saints quarterback and Super Bowl champ, Drew Brees, put his single-digit-handicap and strong charitable efforts on display on June 28th in an event at Topgolf Austin. Billed as “The Topgolf Challenge with Drew Brees”, the event is a partnership between the increasingly popular golf range and the Brees Dream Foundation, with money being raised for the Dell Children’s Medical Center of Central Texas. Source: Golf Digest. 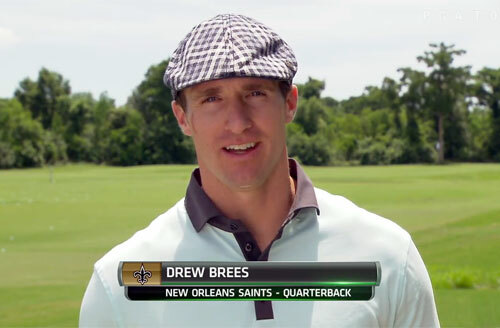 Drew Brees is the current quarterback for the New Orleans Saints.He is a seven-time Pro Bowl selection, holds multiple NFL passing records and led the Saints to a Super Bowl championship in 2010. Brees is a hero in New Orleans known for his charitable efforts after Hurricane Katrina, and he has raised more than $22 million through his foundation. The Brees Dream Foundation is raising money in the June 28th event to support the Dell Children’s Medical Center of Central Texas, a child and adolescent healthcare services center in Austin which sees nearly 150,000 patients per year. Sports Speakers 360 is a booking agent for motivational sports speakers. If you would like to book pro athletes or NFL stars like Drew Brees for a speaking engagement or appearance, please contact Drew Brees’s booking agent for speaker fee information. For details on how to hire New Orleans Saints players for appearances, call 1.855.303.5450.